The Fellowship was fortunate enough to obtain a copy of SKULLKICKERS #100 from Image Comics. Jim Zub writes, Edwin Huang draws, Misty Coats colors and Marshall Dillon letters. That’s it. It’s all broken now. Everything. Baldy and Shorty have somehow managed to break the story. They’re stuck in an infinite loop, meeting each other and fighting and drinking and fighting. And in the grand scheme of things, they’re pretty much okay with that. Kusia has a different problem, though; she’s different, but she doesn’t really feel different. But maybe it can work out for her too. Maybe we can all be equal in our mindless fantasy violence. Probably the only thing that’s clear in this issue is the fact that it’s the last Skullkickers issue. The team that has brought us one of the great comics of the decade is moving on to do more great things. And I’m really looking forward to seeing what that is for each of them. I’m sad that it’s over, but I’m really happy for the success they’ve had and that they will have in the future. 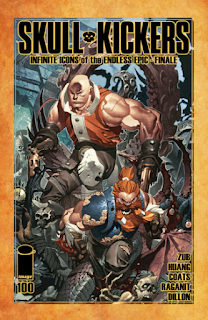 Skullkickers is one of my all-time favorite books, and if you haven’t read it by now, you still can. It’s not going out of style anytime soon. Comedy, fantasy, mayhem, and wonderful writing, art, coloring and lettering. How could it ever really go away? 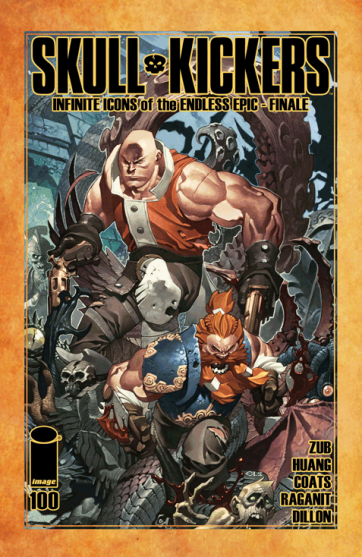 SKULLKICKERS #100 is available now at your FLCS or at imagecomics.com.